← Kick Start Your Day with Spaghetti Muffins! Music – “México Lindo y Querido” from Music for a Mexican Dinner. Tacos and Burritos. Music of Mexico by Mariachi Guadalajara. Released: 2013. The more cookbooks I accumulate, the more I am amused by the names given to recipes, especially from some of the small cookbooklets from the 1930’s through the 1950’s. I have two publications from Gebhardt’s of San Antonio, Texas, a manufacturer of canned chili, beans, chili powders, and the like. 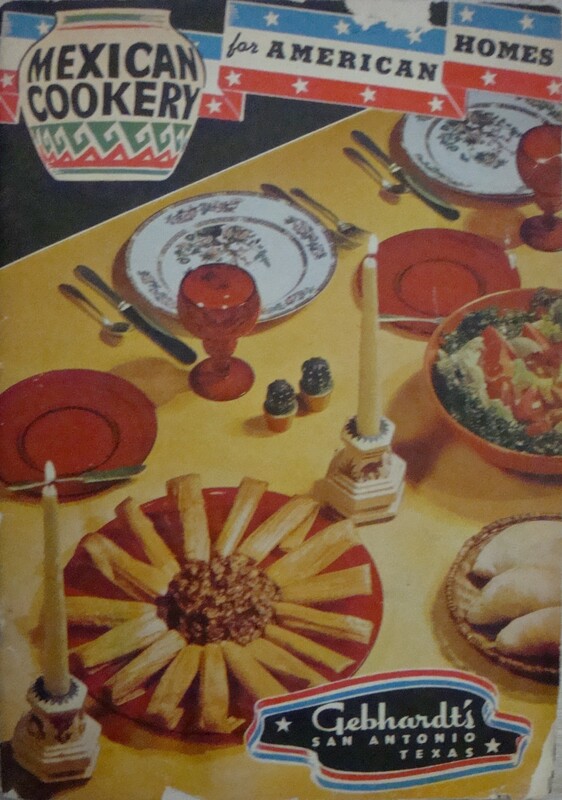 Both booklets are “Mexican Cookery for American Homes”, one dated 1949 and the other, 1960. 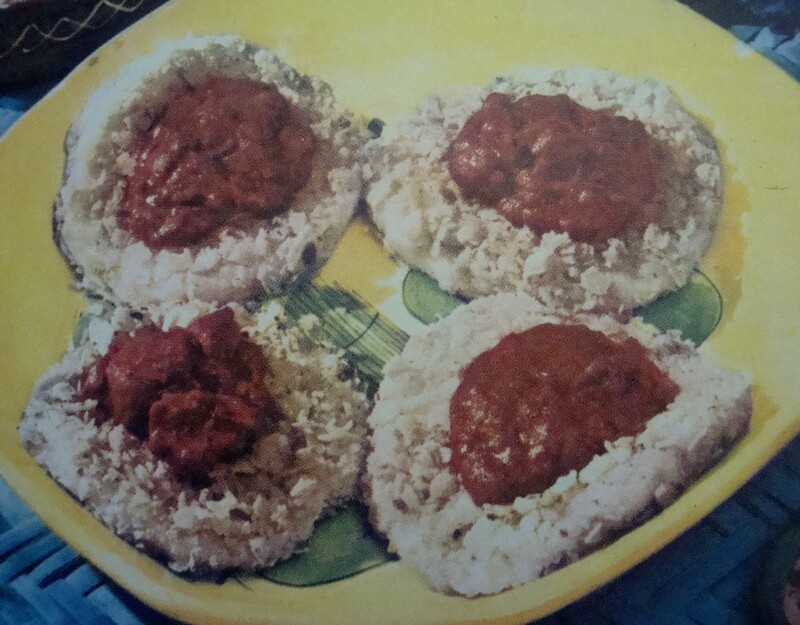 As the authors point out in their cookbook, they note that “Mexican foods are very interesting and appetizing”. What I found rather amazing and somewhat scary, are the instructions at the beginning of the booklet, “Simple Way to Open Can”, “After heating in boiling water, cover can with double thickness of paper towel or newspaper. Then puncture can as shown in illustration at left to permit escape of steam. Use paper to hold can while removing top with can opener”. Now, I know that you can heat a can of condensed milk and it will magically turn into caramel, but the thought of boiling a sealed tin of beans scares the heck out of me. Nonetheless, those are the instructions for several of Gebhardt’s recipes. The recipes, designed to be “Mexican” for the “American” kitchen include “Mock Duck”, consisting of round steak, deviled sandwich spread, flour, bread crumb stuffing, fat and chopped apples. Doesn’t sound very Mexican to me and has no Mexican name. Then, there is “Chili Scrapple”, which is not to be confused with the “Chile Scramble” recipe. If you don’t know your “scrapple” from your “scramble”, you’ll be in trouble here. 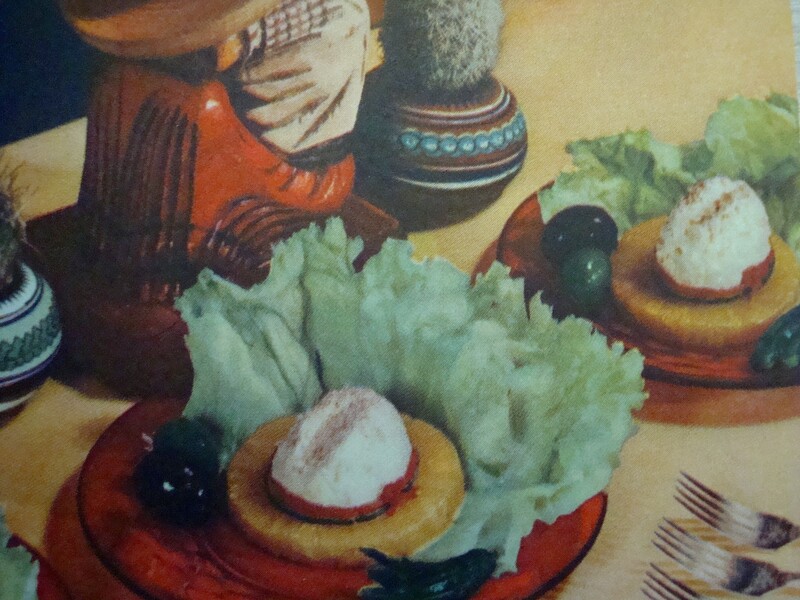 “Potatoes Sombreros” from “Mexican Cookery for American Homes by Gebhardt’s (1960) Cute, huh? 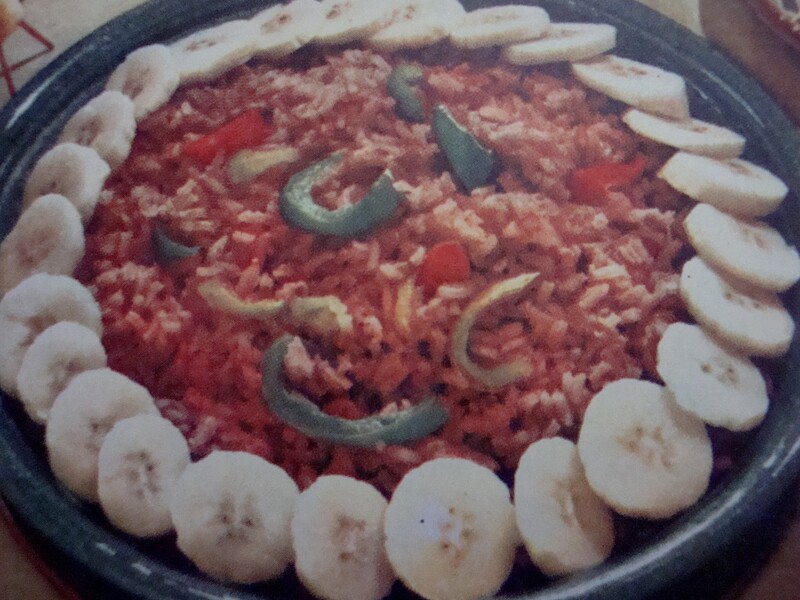 “Exotic Fruit Salad”, in 1949, included tomatoes, pineapple, mint, mayo, salt and chili powder. As I recall (not as far back as 1949! ), growing up, I never saw a fresh pineapple until my Aunt and Uncle, who lived in Hawaii, sent us a couple one Christmas. What an exotic treat it was! Today, you can find pineapples in just about every supermarket. So much for exotic. Ever had “Pasas Endiabladas” (Deviled Raisins)? Cover seedless raisins with salad oil, cook until plump, drain, then sprinkle with salt and Gebhardt’s Chili Powder. Now, there’s a snack to wake you up! Maybe Kellogg’s should be re-thinking their Raisin Bran cereals. 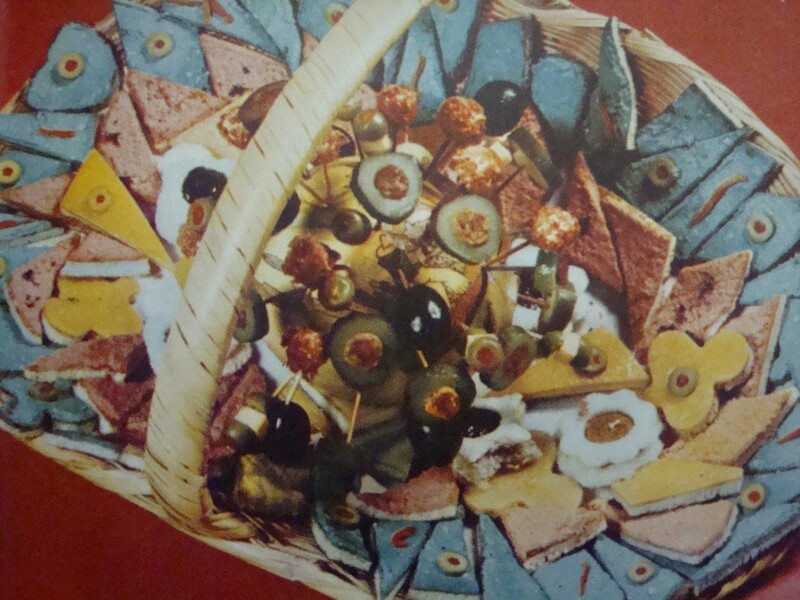 “Sombrero Salad” from “Mexican Cookery for American Homes” by Gebhardt’s (1949) Very authentic Mexican, yes? 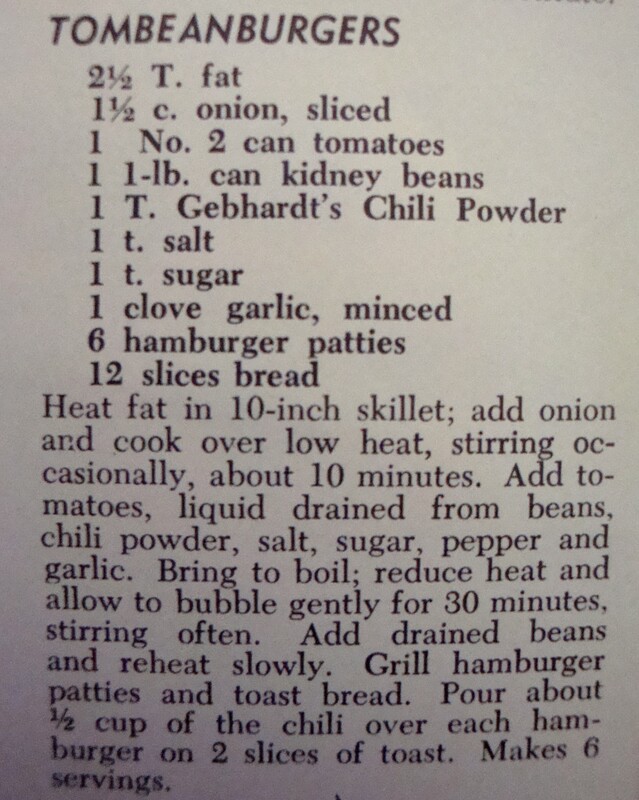 Recipe for “Tombeanburgers” from “Mexican Cookery for American Homes” by Gebhardt’s (1960) A real treat! Lastly, I couldn’t end without mentioning the ever-famous “Tombeanburgers”, a mixture of onion, canned tomatoes, chile powder, spices, all bubbled up. The drained beans are added to the mix and the whole kit and caboodle is dished up over grilled hamburger patties on toasted bread.. Nothin’ sounds Mexican more than a “Tombeanburger”, right? 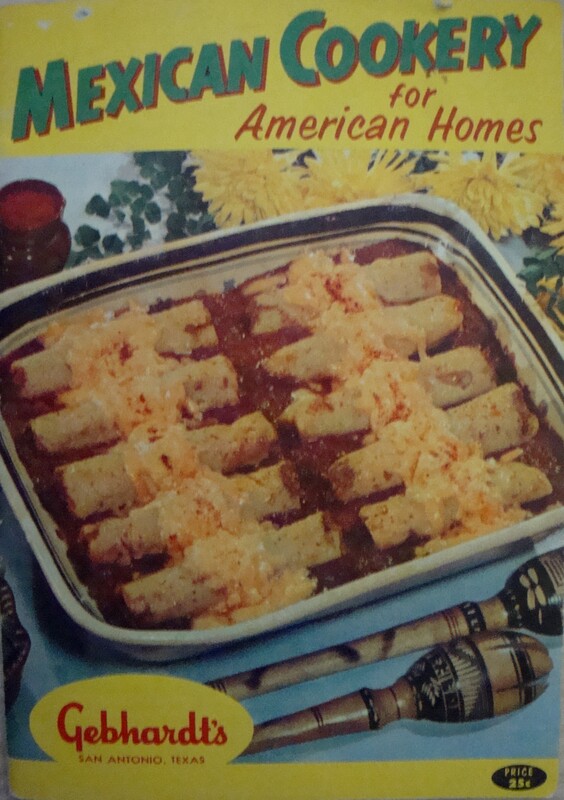 A lot has changed since 1949, including America’s palate for “Mexican” food. We have evolved enough now to eat “real” Mexican food, not “Mexican food for American Homes” (read: gringos) According to http://www.ibisworld.com reports, there are more than 30,000 Mexican restaurants in the USA and this number is expected to increase in the next three to four years. There will be more than enough “Tombeanburgers” to go around! La comida Mexicana es excelente! “Hors D’Oeuvre Suggestions” from “Mexican Cookery for American Homes” by Gebhardt’s (1949). Don’t ask me what the blue stuff is! This entry was posted in Cookbooks, Cooking, Cooking and Social History, Eating, Food Trends, Recipes, Uncategorized, Vintage Cookbooks and tagged Beans, Bologna, Chili, cookbooks, Cooking, Gebhardt's, Mexican Cooking, Mexican food, Mexican food for Americans, Sombrero Salad, Sue Jimenez, time capsules. Bookmark the permalink.